Please make this chili. Please make this chili and then — this is the important part — don’t eat it. Let it cool, put it in an airtight container in the fridge, and wait until the next day. Reheat the chili and eat it. Then stop by and let me know, so we can high-five each other over its rich, sweet, wholesome, and comforting autumn flavor. 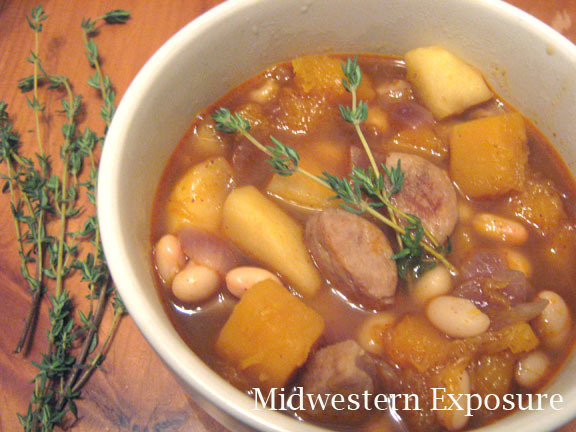 This recipe is modified from the “Harvest Chili” in Better Homes & Gardens’ October 2011 issue. Our friend Kori stopped by recently for a cozy weekend dinner. After decimating the warm, gooey baked brie with jalapeno jelly that she had brought with her, we relaxed with a bottle of vinho verde and a bowlful of this chili. The only thing that could have made the evening more cozy would have been a soft, snuggly kitten with a loud purr. 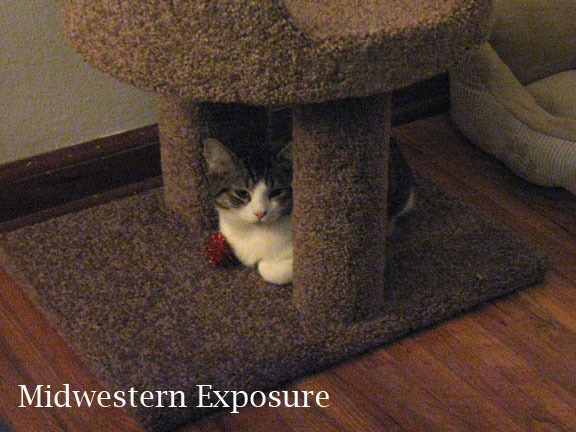 We had that, too: the newest addition to our family, our rumpy Manx kitten, Harkness (a.k.a. “The Captain”). Kittens and chicken apple chili — serious autumn comfort! 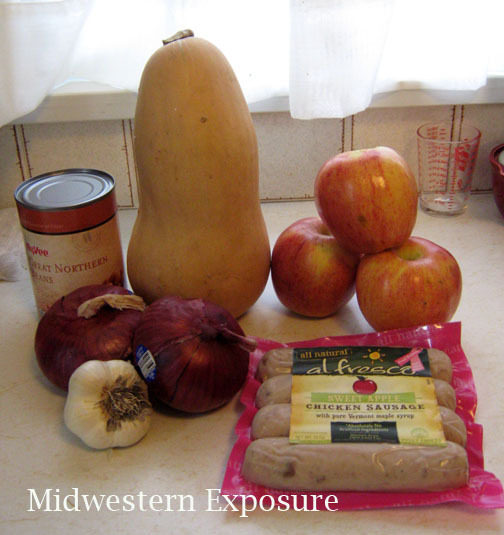 Cut the sausage in half lengthwise, and then slice crosswise into 1/4″ to 1/2″ thick half-moons. Heat 1 Tbsp oil in a large pot over medium-high heat, and cook the sausage (and chicken breast, if using) until lightly browned. Remove sausage from pot with a slotted spoon and set aside. Add the chopped red onion and minced garlic to the pot and cook, stirring, for 2 to 3 minutes, until just beginning to soften. Add the butternut squash and cook for 5 minutes more. Stir in the chili powder, salt, and cayenne pepper. [I chose a chili powder with coriander, cloves and allspice in addition to the usual ingredients. These flavors complemented the apples and squash beautifully, so consider doctoring up your plain chili powder with other flavors.] Add the cooked sausage (and chicken, if using) and chicken broth and stir to combine. Bring the mixture to a boil, then reduce heat and simmer, uncovered, until butternut squash is tender (about 5 to 10 minutes). 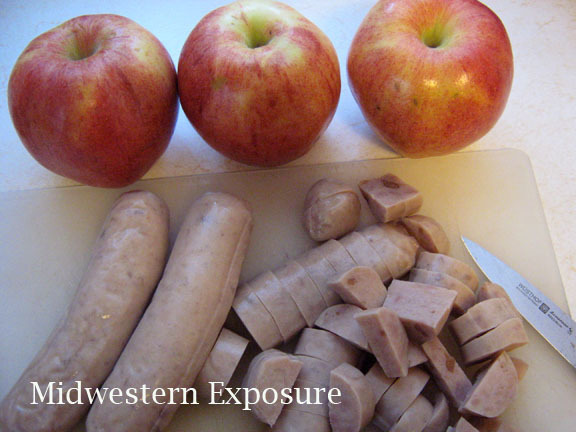 Meanwhile, slice the apples about 1/2″ thick and then cut the slices in half crosswise. Heat 1 Tbsp olive oil in a large skillet and cook the apples for about 5 minutes, until lightly browned. Stir the cooked apples into the chili, along with the fresh thyme. Simmer another minute to heat all ingredients thoroughly, and serve. The chili tastes even better when reheated the next day, after the flavors have had time to marry. Serves 8.